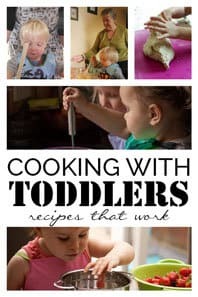 One of the TV shows my toddler and preschooler regularly watched was The Mickey Mouse Clubhouse. In that show, they regularly counted in 10s and it was long before my kids were counting along with them. 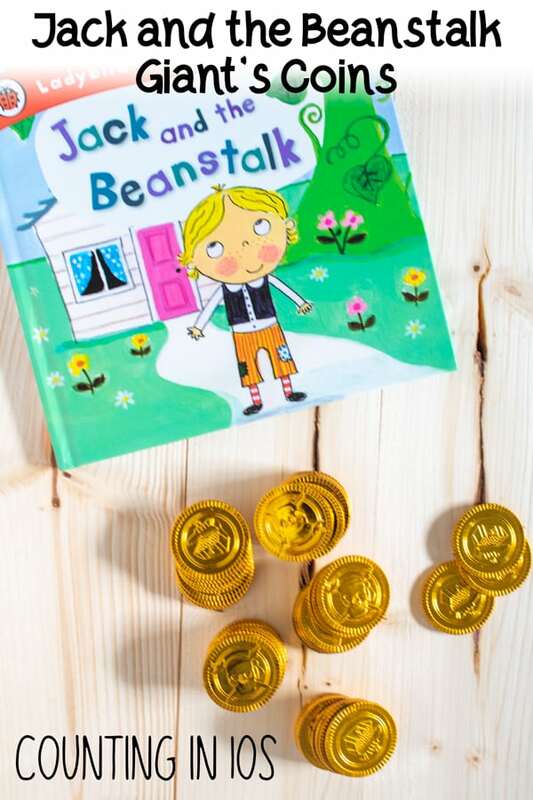 It’s one of the first multiplication tables that kids learn and this Jack in the Beanstalk Math Activity is ideal to work on counting with 10s as we use some of the giant’s coins to count to 10 and then count in 10s. 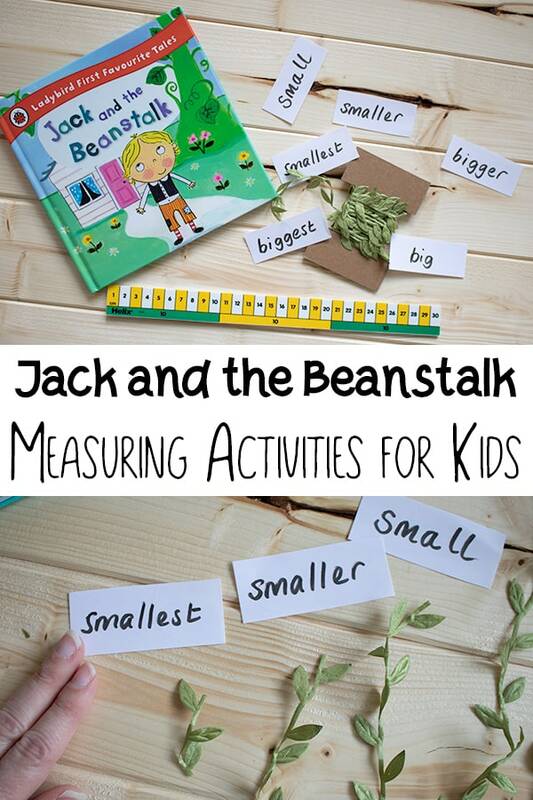 So here we go a simple Jack and the Beanstalk Counting in 10’s maths activity for kids. We love this classic tale and have had a lot of fun focusing on it with these activities. A lot of them focused on mathematics and early number skills which help develop number sense. 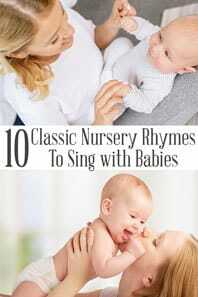 Counting in 10s is one of the first ways in which children meet multiplication, as 10s are one of the easiest times tables to learn you can start to introduce not only the words as you count along with this rhyme but also the numbers writing them down. 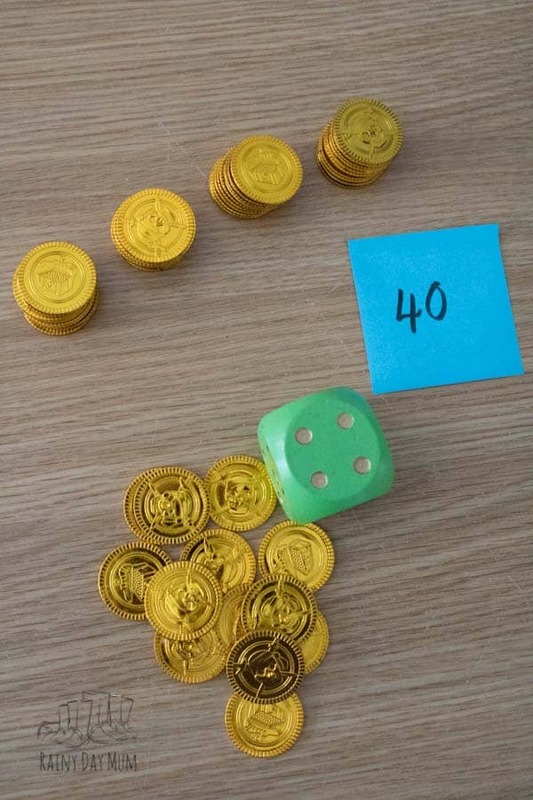 We have introduced a die as well as we move through the activity to add a little randomisation to the counting. Our dice is only a 6 sided dice but you could use a 10 sided die or 12 to work on numbers up to 100 or your 10 times table with older children. 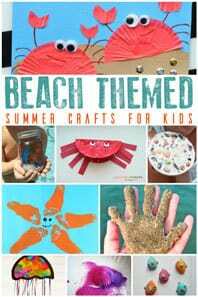 We have included links to some of the resources we recommend for this activity. 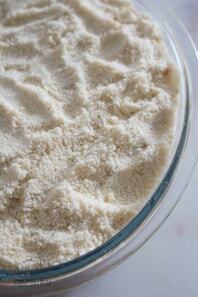 If you buy via our links we may earn a small commission. 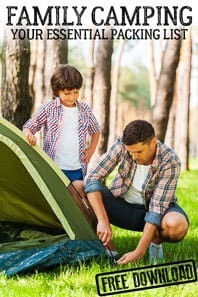 There really is no preparation needed for this activity. 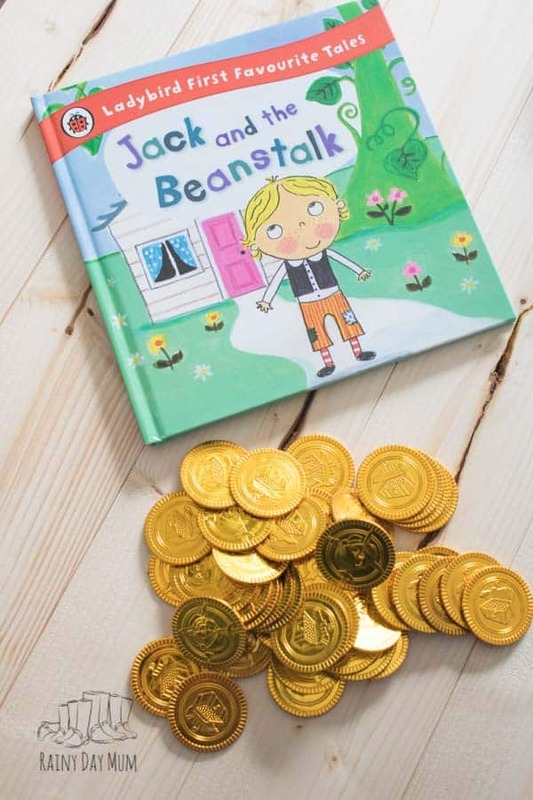 We sat down and read our copy of Jack and the Beanstalk taking time to focus on the gold coins that the giant has that Jack then steals away from him. 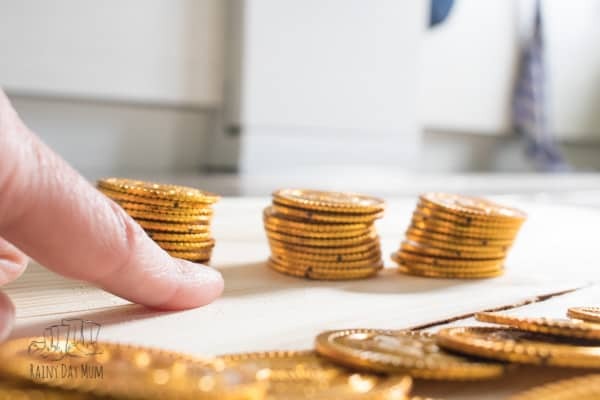 The coins in lots of the copies are stacked in piles this is the easiest way to count coins and also lends itself to working in 10s with kids. 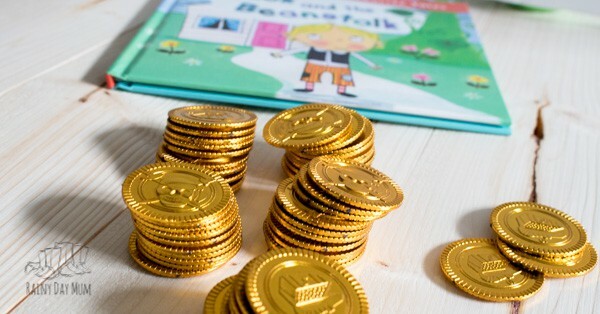 Once we had finished the book we then sat down and counted out our coins – we counted out 10 and then made a pile. Then repeated till we had a number of piles. 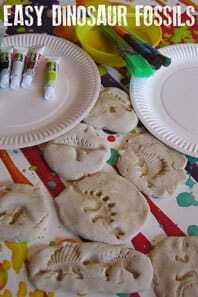 This was an activity that we repeated as my kids’ skills developed. 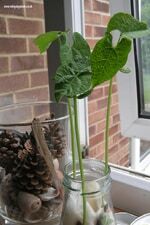 Sometimes we would use it with Jack and the Beanstalk and other times we would be inspired by a pirate theme or even a shopping theme and use the same idea there. 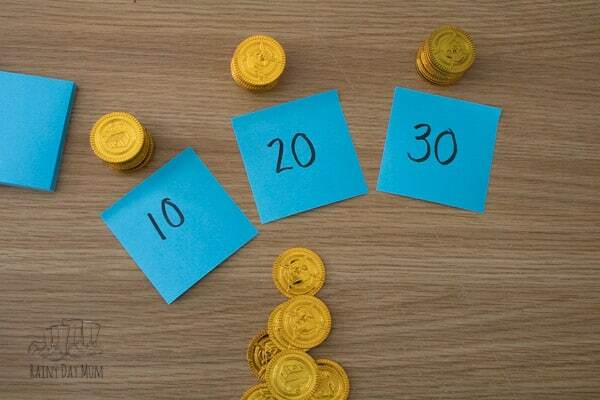 Once they had the counting out loud in 10s down we then moved to introduce the written numbers 10, 20, 30 etc…. First, working with the kids to place the correct number in front of the piles in order. Then giving them a set of the numbers and asking them to put them in front of the piles themselves in order. 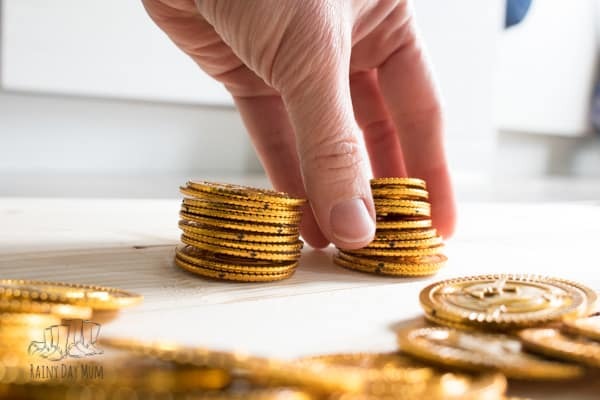 Throughout we had counted out the piles from a pile of coins we had set aside. But we wanted to make it a little more random so we introduced a die and rolled it to work out how many piles we would make. 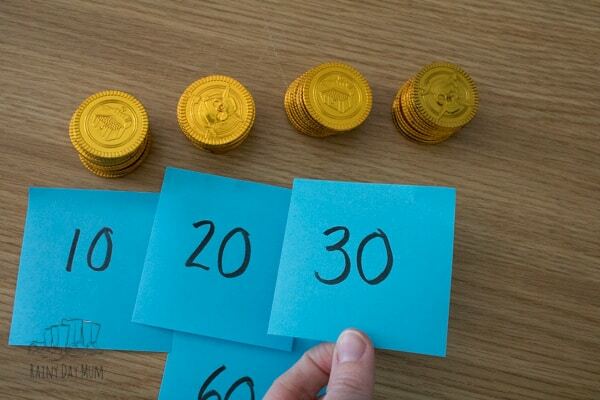 I would get my kids to count out the tens on their fingers first to make a prediction and then do the activity. 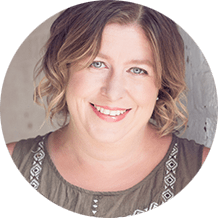 With my kids we focused on counting in 10s first of all, but you could also use this activity to count in any set. 2s, 5s and 10s are the first 3 times tables that kids learn. 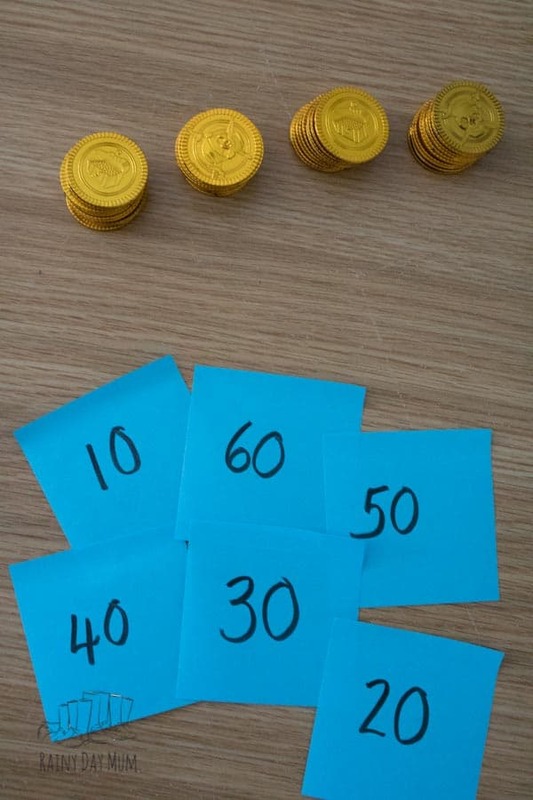 You could use a set of number cards with those numbers on and then ask your child to pick randomly from them to use the activity to count in a different number. 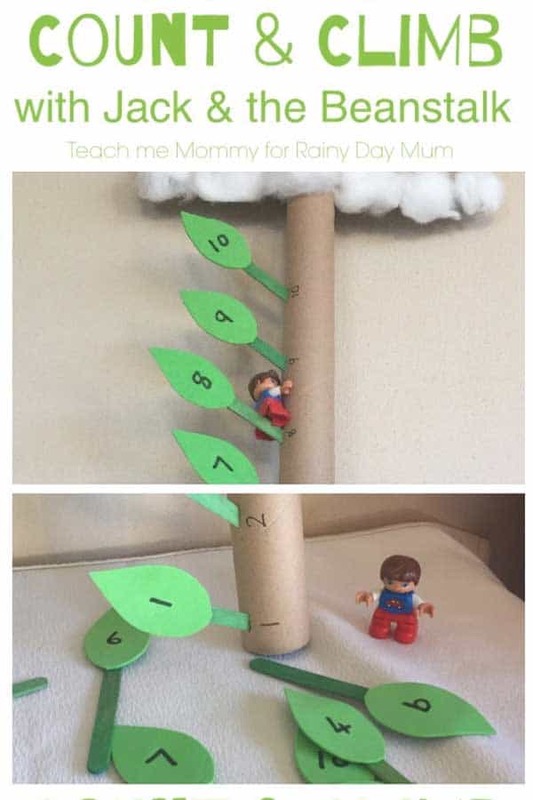 Work on Numbers from 1 upwards with this Count and Climb with Jack and the Beanstalk Math Activity for your Toddlers and Preschoolers. 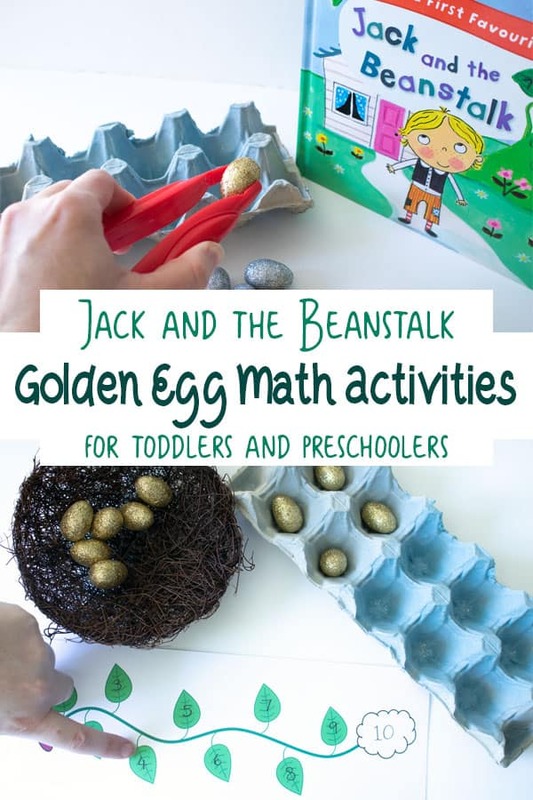 Count out and work on basic addition and subtraction with our Jack and the Beanstalk Golden Egg Math Activity for Kids.